Changing My Pet’s Diet…What Really Happens? 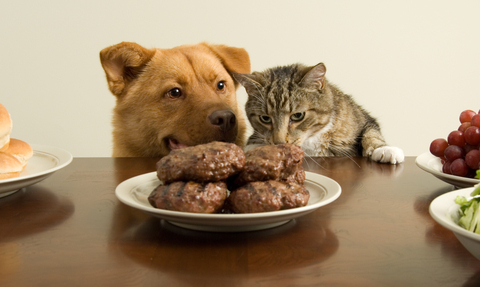 Most often pet owners are faced with having to change their pet’s diet for a variety of reasons. Reasons may be from a recall, discontinuation of product, ingredient changes, or even that you have relocated. Maybe your pet just “doesn’t like it” any more. While all these reasons are possible, we need to understand how the body functions, what we can expect and what is really normal. Few animal’s digestive systems are designed to eat only one very specific food for their entire life. All creatures are designed to eat a variety of foods for the purpose of meeting specific nutritional needs based on the current condition of their body. Even though a majority of pet food companies claim their products are nutritionally complete and balanced, the dynamic, ever-changing requirements of a healthy functioning body make it impossible for any single food to satisfy these needs. This is the reason we have ongoing cravings for different foods on a daily basis. There are physiological requirements that change from moment to moment. These ever dynamic requirements affect the performance of all bodily functions. It is obvious that animals burn more energy when they are active than when they are at rest. An injured, diseased, or healing body has very different needs than a healthy one. This is why it is a necessary requirement that all pets have a variety of different foods available on a regular, rotating basis. This approach should also be utilized with supplements as well for the same reasons. As humans, we all know that when we do a dietary change, the body cleanses itself of low value, indigestible foods. These inappropriate foods can manifest themselves as soft stool, diarrhea, bloody mucous diarrhea, and even vomit. It doesn’t mean the new food is bad or doesn’t agree with them. This is actually normal as it is the natural physiological process that the body uses to maintain or promote proper health. When pets are fed a variety of foods on a daily or even a per meal basis, the cleansing is minimal and regular. Dogs and cats naturally have soft formed stools. Hard stool indicates constipation, dehydration, or improper foods which are routinely added by food manufacturers in order to make feces clean up easier. When it comes to our own bodies, our stool and bathroom habits vary based on what we have or haven’t eaten, the amount we consume, and even the time of day. We expect our pets, especially our dogs to alter their natural body processes to accommodate our schedules however, is that normal? How does this affect their bodily functions? There should be no cause for alarm here. These apparent gastric changes are not normally a sign of illness or disease, but a change in the utilization of nutrients and the expulsion of those components not needed. Food also provides a way to remove harmful chemicals and toxins from our body. Different foods remove different things from various locations within the digestive tract. We are all familiar with dogs and cats eating grasses and usually vomiting. We consider that a normal healing process. Transitioning can sometimes be messy and inconvenient; a move to a healthy, species appropriate rotational natural diet should be paramount. If this does happen, we feel that a few days of discomfort to accomplish a long healthy life is well worth the time we spend cleaning up an extra mess. In the long run, a healthy lifestyle will help cut down on excess medications and doctor’s visits promoting a much happier pet. ← What Is All The Controversy Regarding Spay And Neuter?